The reduction in the cost of exporting offered by international transactions over the internet helps small firms in developing countries reach consumers all over the world. This column argues that this bias in favour of small firms has an impact on labour markets, as small firms tend to hire unskilled workers disproportionately. By levelling the playing field between small and large firms in terms of access to international markets, online trade can contribute to reducing wage and, ultimately, income inequality. Technological progress is often associated with an increase in the wage gap between skilled and unskilled workers. The introduction of the internet and information technologies is no exception. Ackerman et al. (2015) convincingly show, using Norwegian data, that the adoption of broadband internet increases the wage gap between skilled and unskilled workers. International trade is often also seen as one of the main culprits behind increases in the wage gap. Autor (2014) and Autor et al. (2015) argue that the negative impact of imports from China on wage and employment of unskilled workers in the US is much larger than the impact of skill-biased technological change. A potential explanation for the bias in favour of skilled workers associated with technological progress and international trade is the presence of high fixed costs associated with the adoption of new technologies and with firm access to international markets. Large firms are more likely to be able to afford these large fixed costs. They also tend to hire a relative larger share of skilled workers who are therefore going to benefit disproportionately from both technological innovations and global markets. By combining new information technologies and international trade through e-commerce, small firms and their relatively unskilled workers may end up benefitting more than skilled workers. The internet has significantly reduced the cost of conducting international transactions between distant firms and consumers (Lendle et al. 2016). Online platforms such as eBay, Amazon, and Alibaba have allowed very small firms to export by significantly reducing the fixed cost of accessing export markets. As a result, more than 95% of US firms on eBay export, regardless of their size (Lendle et al. 2013). In other words, e-commerce and online platforms may be allowing unskilled workers to also benefit from global markets, and therefore help reduce the wage gap between skilled and unskilled workers. In a new paper, we examine this question (Cruz et al. 2017). 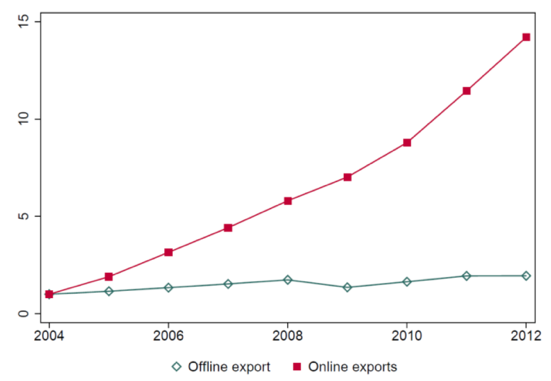 Online trade has been rapidly increasing in the last decade. Because data on cross-border trade flows are not yet collected by any national or international agency, we use cross-border flows on the eBay platform to proxy for the evolution of online trade. While world trade increased by 92% (8% annual growth) during the period 2004-2012, cross-border online trade grew seven times faster (Figure 1) and did not seem to be affected by the Great Trade Collapse. One could argue that while growing rapidly e-commerce is too small to matter. The best estimates suggest that it represents less than 10% of total retail sales; the share of cross-border online trade in total e-commerce is around 20%. However, given the rapid growth of e-commerce and cross-border online trade, both shares are expected to double over the next five years (UNCTAD 2015). For policymakers, it is important to understand early the consequences of a rapidly growing phenomenon. Note: The evolution of world trade is from United Nations' Comtrade database. The evolution of online cross-border trade is proxied by the evolution of eBay cross-border trade (Lendle et al. 2016); fixed price transactions only. 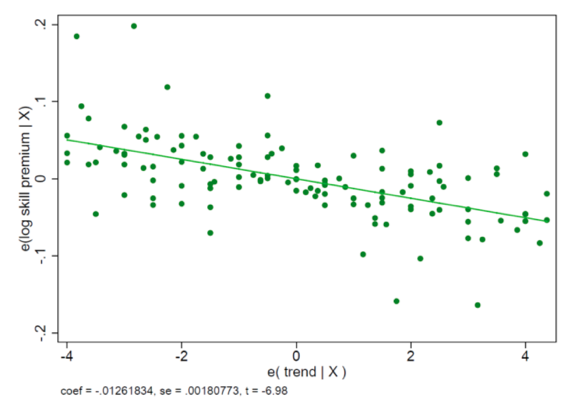 Note: This is the partial plot of a regression of the log of the wage gap between skilled and unskilled workers on a time trend and country fixed effects for countries in our sample with more than 3 observations over the period 2004-2012. The estimates of wage gap are from Cruz and Milet (2017). The wage gap between skilled and unskilled workers has been declining in developing countries over the last decade. There is robust evidence of this pattern, especially for Latin America (Gasparini et al. 2011, Torre et al. 2015). In Latin America, the decline in income inequality observed since the turn of the century has been driven to a large extent by the decline in the wage gap between skilled and unskilled workers (Lustig et al. 2013). In other regions, other forces pushing towards higher income inequality have more than compensated for the decline in the wage gap. Our focus, however, is on the wage gap, and our sample, based on Cruz and Milet (2017), is no exception, with an average annual decline of 1% (Figure 2). Thus, at prima facie, as online exports were rapidly growing, the wage gap between skilled and unskilled workers was declining. Clearly, the evolution of the wage gap may be explained by other more important factors than online exports. The important question here is whether online exports have had a causal impact on the wage gap that could become an important force in the fight against income inequality in the future. After instrumenting online exports with time-varying geography determinants of bilateral online trade and demand shocks in partner countries to address endogeneity and measurement errors concerns, we find that as online exports increase, the wage gap between skilled and unskilled workers declines. A 1% increase in online exports reduces the wage gap between skilled and unskilled workers by 0.01%. Although the coefficient is small, one needs to keep in mind that online trade has been increasing extremely fast and will likely keep expanding in developing countries. Interestingly, the negative impact of online exports on the wage gap is only observed in countries with a large share of the labour force working in small firms. These firms are also more likely to benefit from the reduction in the fixed cost of exporting provided by online markets. They also tend to hire unskilled workers disproportionately. Therefore, as the share of online exports increases, the demand for labour in small firms increases too, which shifts outwards the relative demand for unskilled workers and ultimately reduces the wage gap between skilled and unskilled workers. Our results suggest that reducing barriers to online trade may be desirable for reasons that go beyond economic efficiency, as it may help reduce income inequality by narrowing the wage gap between skilled and unskilled workers. Unfortunately, anyone who has tried to purchase goods online across borders knows that there are still important administrative barriers to international trade online. This includes unclear taxation and customs requirements or long customs delays. Solutions to these problems need to be considered. An example of a measure that could help address these problems is the introduction of higher de minimis thresholds under which no customs duties or other taxes (such as VAT) apply. Streamlined procedures for payment of customs duties and other taxes, such as e-Customs or e-taxation, or a coordination effort by exporting and importing countries to allow for the payment of customs duties online, can also help. Bilateral, regional, and multilateral trade agreements also need to start addressing the specific problems faced by cross-border e-commerce. Autor, D (2014), “Polanyi's Paradox and the Shape of Employment Growth”, NBER Working Papers 20485. Autor, D H, D Dorn and G Hanson (2015), “Untangling Trade and Technology: effects from local labor markets”, Economic Journal 125(584): 621-646. Akerman, A, I Gaarder, and M Mogstad (2015), “The Skill Complementarity of Broadband Internet”, The Quarterly Journal of Economics 130 (4): 1781-1824. Cruz, M and E Milet (2017), “Skill Premium in Developing Countries”, mimeo, University of Geneva. Cruz, M, E Milet and M Olarreaga (2017), “Online exports and the Wage Gap”, CEPR Discussion Paper 12092.
de la Torre, A, A Ize, G Beylis and D Lederman (2015), “Jobs, Wages and the Latin American Slowdown ”, World Bank Other Operational Study 22709. Gasparini, L, S Galiani, G Cruces, and P Acosta (2011), “Educational Upgrading and Returns to Skills in Latin America: Evidence from a Supply-Demand Framework, 1990-2010”, IZA Discussion Paper 6244. Lendle, A, M Olarreaga, S Schropp, and P-L Vézina (2013), “eBay’s anatomy”, Economics Letters 121(1): 115-120. Lendle, A, M Olarreaga, S Schropp, and P-L Vézina (2016), “There Goes Gravity: eBay and the Death of Distance”, Economic Journal 126 (591): 406-441. Luo, R (2017), "Skill Premium and Technological Change in the very Long Run: 1300-1914", Discussion Papers in Economics 17/09, University of Leicester. Lustig, N, L F Lopez-Calva, and E Ortiz-Juarez (2013), “Declining Inequality in Latin America in the 2000s: The Cases of Argentina, Brazil, and Mexico”, World Development 44(0): 129-141. UNCTAD (2015), “Information Economy Report 2015: Unlocking the potential of E-Commerce for developing countries”, UNCTAD/IER/2015. Varian, H (2005), “Technology Levels the Business Playing Field”, The New York Times, 25 August.